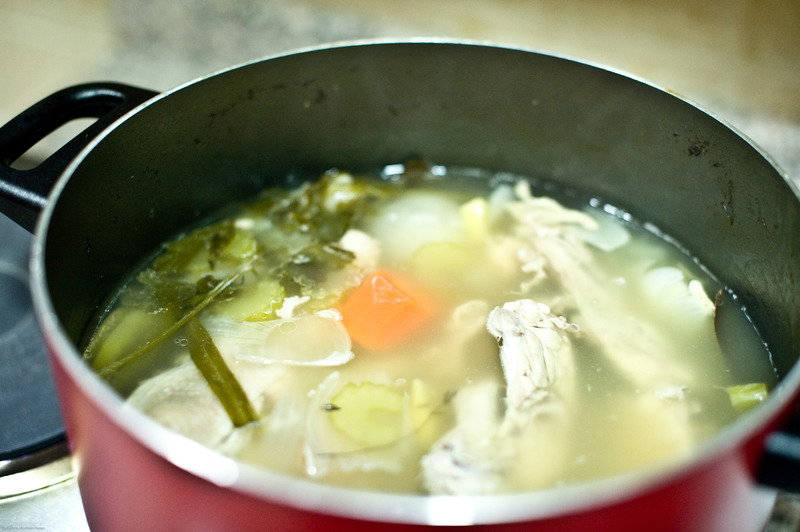 What on earth is white chicken stock? I know… it may sound weird… it did to me at first. I mentioned to The Chef that we should do chicken stock for the next cooking class, since this is such a major ingredient and a super taste booster in lots of recipes. His response: “White or brown?” I was stumped. Of course, what came next was a lesson that explained the difference between white and brown stocks, which was pretty cool enough to share with you. This is the method that is most common (well, at least the one I knew). White stocks are made by combining all ingredients with a cool liquid and gently simmering over gentle heat. This is a slow and steady process which cannot be hastened (well, of course it can be, but to the demise of the stock quality. Do this when you have a little extra time in the kitchen). 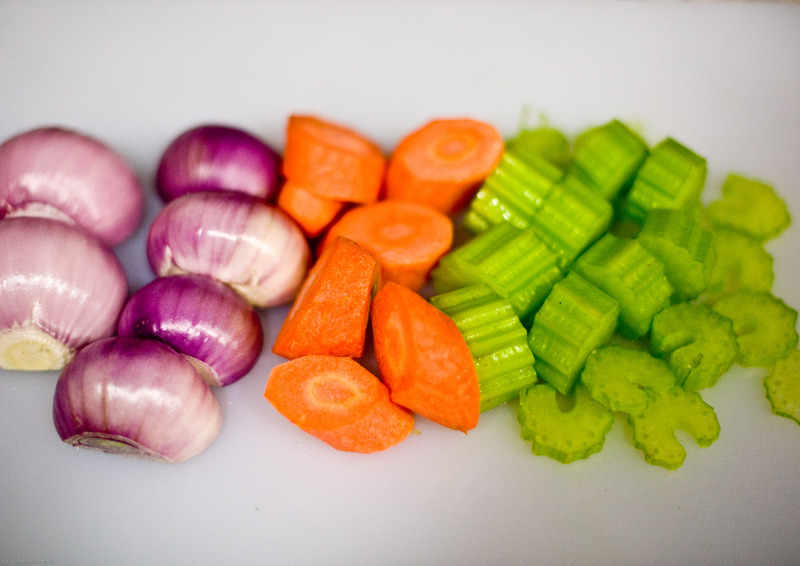 These involve the roasting or sautéing of the mirepoix (holy trinity aromatic veggies – carrots, white onions and celery) in enough fat to produce a rich dark colour before simmering. A fumet (foo-may) is a concentrated stock, esp. of game or fish, used as flavoring, which are also called essences, require sweating or smothering the main ingredients often with a dry white wine, before simmering. Fumets are made in low casseroles on rondeau pots which have lower sides while stocks are made in higher stock pots. You simply have to go back to the bones. 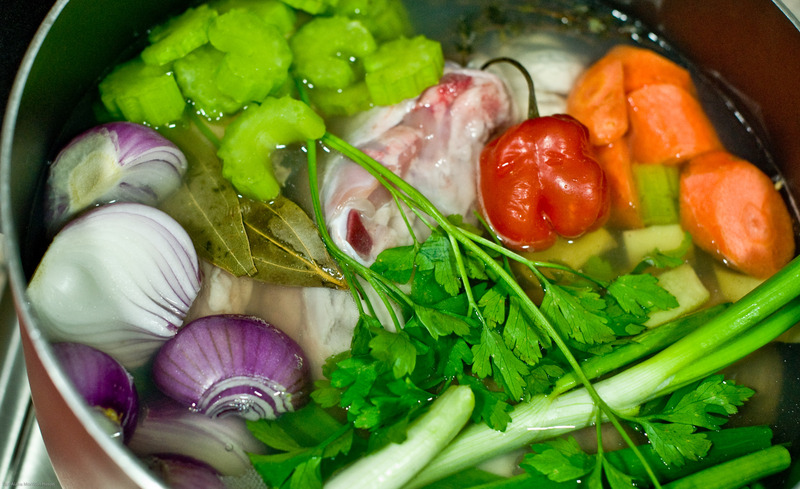 Using the bones of poultry, meat and fish will help to deepen the flavour of the stock. Of course, you will use one of the above usually for the preferred stock. Today we are concentrating on chicken. This is where leftover bones from chicken fabrication come into good use. 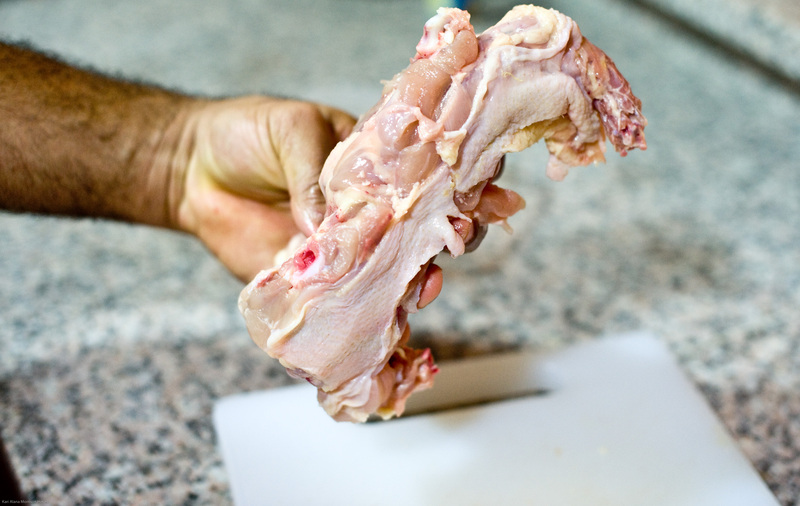 Thaw frozen bones in the bottom of the fridge before using.For thorough flavour extraction, cut bones into 3-inch pieces. This will also increase the amount of gelatin, and nutritive value of the stock. Younger animals are best because their cartilage breaks down into sweet gelantinous gooeyness giving your stock body. 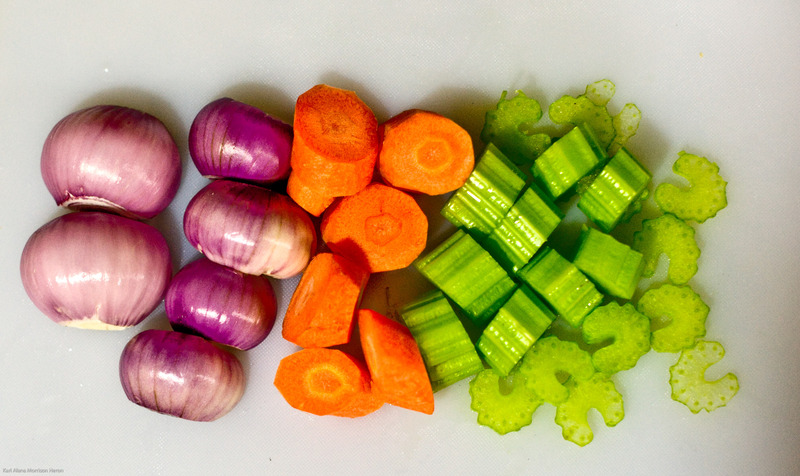 Cut your mirepoix into large enough pieces (about 1- inch). Arrange whatever other aromatics and herbs you wish to add. 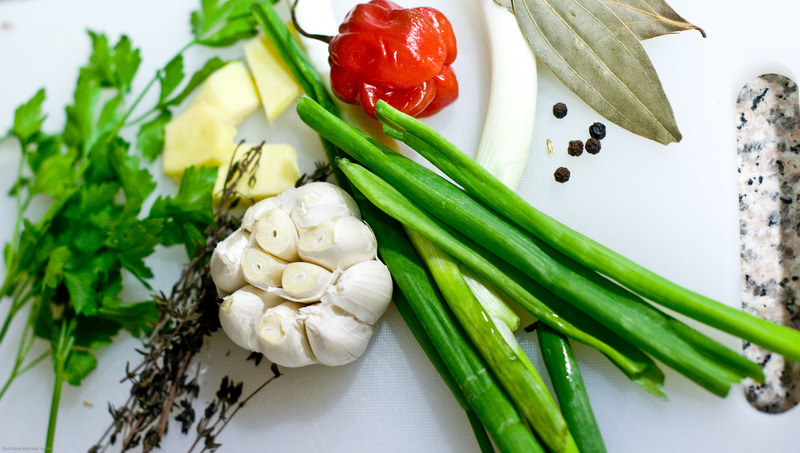 If you have the time, inclination and cheesecloth, arrange herbs and spices into a bouquet garni for easy removal. If you are like me, just put it all in loosely in the pot and worry about that bridge when it is time to cross it. If you want a mildly flavoured stock, you may want to cross the bridge up front with the bouquet garni so that you can remove easily if the flavours become too intense. Again, if you are like me, bring on the flavour! Turn on gentle heat and cover and allow to simmer gently for about 90 minutes, but don’t just set it and forget it. You may want to remove pepper when it starts to swell before it bursts. 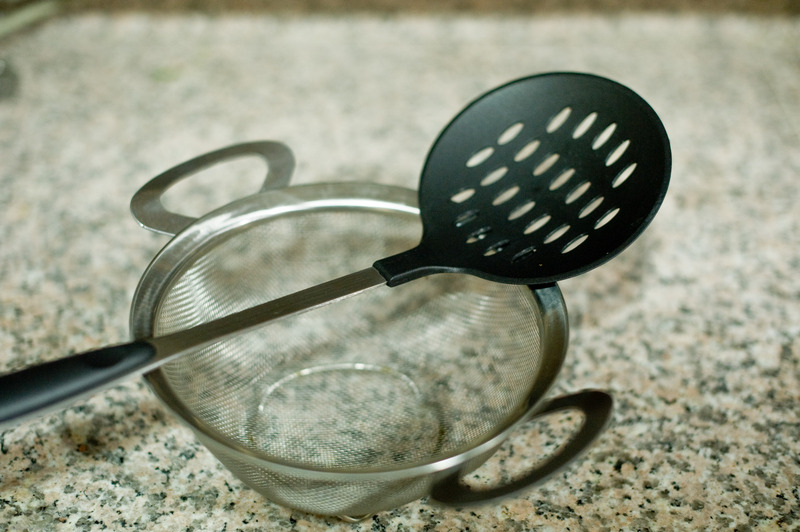 Keep your skimmer or ladle at hand, as well as a strainer (for when the time comes to cross the bridge). The skimmer is shown here, but we both prefer to use the ladle. Use whatever feels better to you. Within the first 30 mins, check for any frothing on top of liquid and skim at intervals throughout cooking. Skimming the scum will produce a clearer stock. CHEF’S NOTE: You should taste your stock for flavour. When done, cool quickly by pouring into storage container and placing in an ice bath with cold water then put in freezer to further cool. It is important to cool your stock as quickly as possible to prevent any contamination by bacteria. You can also freeze in ice-cubes and then transfer to a freezer bag. Stock cubes will defrost quicker than bigger batches and also allows you to add a little smaller portions when needed. On another note, mirepoix calls for white onions but The Steward is obsessed with “how red onions photograph better.” White onions give you clearer stock. For more Free Cooking Classes..
How do you do a vegetarian broth? I never thought about putting my stock in an ice cube trays! What a great idea. Can’t believe I never thought of that. Especially since I used to make homemade babyfood and loved to portion out the food in ice cube trays. Great post. I love homemade stock. Yours is so colorful! I use leftover chicken carcasses to make mine, with some carrots, celery and onions. I’ll be trying this over the next few months when I’m making more soups for those cold, fall days. Thanks! Perfect. Thanks for the great pics and description. When I cook my chicken in a crockpot to get cooked chicken… with the “trinity” as well, I usually save the broth from that… I see I may need to change that up a bit to get real stock. I love the ice-cube thing, do it all the time, if I have not empty trays I pour the broth into a jelly roll pan and then freeze it, chip it up and bag it…. maybe I am not that gourmet… more of a shoe string budget cook! Love the jelly roll pan idea! It’s about being practical… the cubes never get presented on the table so they don’t have to be picture perfect! Thanks for sharing the way you do it! I constantly need chicken stock during this time of year. I will definitely be making this. Nice to save some money too! Yes- it will indeed save you lots of money! And it is so easy and can be frozen for long periods. Great post! I use a lot of whole roasted chickens in my weekly menu planning… homemade stock is a fantastic way to get all the remaining nutrients and add great flavor to future dishes. Specifically, the gelatin/collagen that is extracted from the bones is extremely good for our digestive systems, hair, nails and skin. Thanks for sharing this recipe!